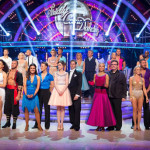 Mark Benton and Iveta Lukosiute became the ninth couple to leave Strictly Come Dancing as they lost the dance-off with Ashley Taylor Dawson and Ola Jordan in week 10. In Musicals week it was Mark’s fourth dance-off in a row so it was no surprise when the judges finally decided it was time for Mark to leave. With Mark’s departure we now have six couples capable of getting to the final. With only three weeks of the competition to go it will depend on how each couple performs on the night and how popular they are as performers. One thing we do know is that Susanna Reid must be more popular with the viewers than Ashley as she overhauled him after the viewer vote to escape the bottom two. The judges were unanimous in saving Ashley and Ola with Craig Revel Horwood, Darcey Bussel, Bruno Tonioli and Len Goodman all agreeing that they were the couple to save in the dance-off so it was time for Mark Benton and Iveta Lukosiute to dance their final dance. Mark Benton didn’t appear at all surprised that he has finally left the show. Ashley Taylor Dawson looked a little disappointed that he had found himself in the bottom two but at least he knows that he will have to dance very well to stand a chance of making the final. In the dance-off Mark Benton and Iveta Lukosiute repeated their Samba to ‘I Just Can’t Wait To Be King’. Bruno had suggested Mark try to add a bit more bounce to his dance-off routine but with Mark’s dodgy knees that was a big ask. Ashley Taylor Dawson and Ola Jordan reprised their Rumba to ‘A Whole New World’. Craig suggested that Ashley add a bit more hip action and put more expression in his free arm as he tackled the dance-off. Claudia and Tess again did a great double act to present the results show. We also had a performance by Alfie Boe who sang ‘Bring Him Home’ from Les Misérables. So we have six celebrities left in the competition with two more shows and then the final to go. It really could not be more difficult to chose the final three as they all have their chances. This week Abbey and Patrick were top of the leaderboard with Ashley and Susanna towards the bottom but it could be oh so different next week.